Arthrobacter sp. strain FB24 is a species in the genus Arthrobacter Conn and Dimmick 1947, in the family Micrococcaceae and class Actinobacteria. A number of Arthrobacter genome sequences have been completed because of their important role in soil, especially bioremediation. This isolate is of special interest because it is tolerant to multiple metals and it is extremely resistant to elevated concentrations of chromate. The genome consists of a 4,698,945 bp circular chromosome and three plasmids (96,488, 115,507, and 159,536 bp, a total of 5,070,478 bp), coding 4,536 proteins of which 1,257 are without known function. This genome was sequenced as part of the DOE Joint Genome Institute Program. Arthrobacter sp. strain FB24 was isolated from a microcosm made from soil collected at an Indiana Department of Transport facility in Seymour, Indiana. This site was of particular interest because the soils were contaminated by mixed waste, both petroleum hydrocarbons and extreme metal (chromium and lead) levels . Details of microcosm enrichment and isolation procedures used to obtain the Arthrobacter strain have been described previously . This isolate was of particular interest because of its extreme resistance to chromate [3,4]. This work is a part of a larger study determining the compositional and functional diversity of bacterial communities in soils exposed to long-term contamination with metals [5-7]. Arthrobacter sp. strain FB24 is a high G+C Gram-positive member of the Micrococcaceae (Figure 1, Table 1). The strain is a facultative, non-motile aerobe with characteristic morphology of rod-shaped cells (Figure 2) that become coccoid in stationary phase. Strain FB24 is able to use a number carbon sources for growth, including glucose, fructose, lactate, succinate, malate, xylose and aromatic hydrocarbons (hydroxybenzoates, phthalate). Additionally, this Arthrobacter sp. strain is resistant to multiple metals: arsenate, arsenite, chromate, cadmium, lead, nickel, and zinc. Phylogenetic tree of Arthrobacter strain FB24 relative to nearest neighboring Arthrobacter type strains and Micrococcaceae strains with finished genome sequences: A. arilaitensis re117 (FQ311476) , A. aurescens TC1 (NC_008709) , A. chlorophenolicus A6 (NC_011886), A. phenanthrenivorans Sphe3 (CP002379 , Kocuria rhizophila DC2201, Microccus luteus Fleming NCTC 2665, Renibacterium salmoninarum ATCC 33209, Rothia dentocariosa ATCC 17931, and Rothia mucilaginous DY-18. The sequences were aligned in ClustalX and a consensus tree was generated using a 1,000× repeated bootstrapping process [11,12]. Transmission electron micrograph of Arthrobacter sp. strain FB24. Cells were grown in nutrient broth for 15 h (~early stationary phase), fixed in 3% glutaraldehyde in 0.1 M cacodylate buffer, then fixed in reduced osmium, followed by a series of ethanol dehydration steps. Cells are then embedded in Spurr resin, stained with uranyl acetate and Reynold’s lead citrate. Image was captured on Kodak SO-163 film at 33,000× magnification. Arthrobacter sp. strain FB24 was chosen for sequencing by DOE-JGI because of its extreme resistance to chromate. Table 2 presents the project information and its association with MIGS version 2.0 compliance . The FB24 culture used for DNA extraction was started from the glycerol stock (stored at -80 ºC) that was made from the original isolate. Cells were streaked onto a 0.1× nutrient agar plate, incubated at 30ºC, then a single colony was used to grow a culture in 0.25× nutrient broth (NB) (Difco, USA). Total genomic DNA was extracted from cells grown in liquid culture using the standard CTAB procedure . 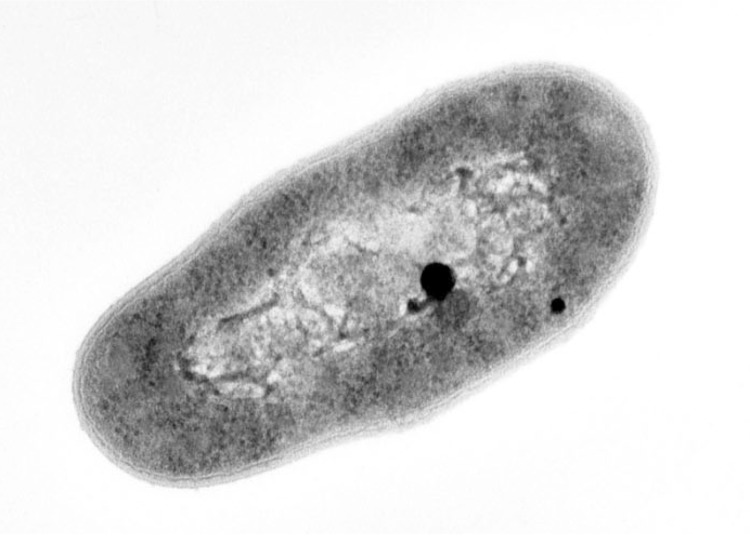 The random shotgun method was used in Sanger sequencing the genome of Arthrobacter sp. strain FB24 at the DOE-Joint Genome Institution (DOE-JGI). Medium (8 kb) and small (3 kb) insert random libraries were partially sequenced with average success rate of 88% and average high-quality read lengths of 614 nucleotides. Sequences were assembled with parallel phrap (High Performance Software, LLC). Possible mis-assemblies were corrected with Dupfinisher  or by analysis of transposon insertions in bridge clones. Gaps between contigs were closed by editing, custom primer walk or PCR amplification. The completed genome sequence of Arthrobacter sp. FB24 contains 89530 reads, achieving an average of 15-fold sequence coverage per base with an error rate less than 1 in 100,000. The sequences of Arthrobacter sp. FB24 can be accessed using the GenBank accession number NC_008541 for the chromosome and NC_008537, NC_008538, NC_008539 for three plasmids. Automated gene prediction was performed by using the output of Critica , combined with the output of Generation and Glimmer . The assignment of product descriptions was made by using search results of the following curated databases in this order: TIGRFam; PRIAM (e–30 cutoff); Pfam; Smart; COGs; Swissprot/TrEMBL (SPTR); and KEGG. If there was no significant similarity to any protein in another organism, it was described as “hypothetical protein.” “Conserved hypothetical protein” was used if at least one match was found to a hypothetical protein in another organism. EC numbering was based on searches in PRIAM at an e–10 cutoff; COG and KEGG functional classifications were based on homology searches in the respective databases. Additionally, the tRNAScanSE tool  was used to find tRNA genes, whereas ribosomal RNAs were found by using BLASTn vs. the 16S and 23S ribosomal RNA databases. Other “standard” structural RNAs (e.g., 5S rRNA, rnpB, tmRNA, SRP RNA) were found by using covariance models with the Infernal search tool . The HMMTOP program was used to predict the number of transmembrane segments (TMSs) in each protein. Those predicted to have two or more TMSs (about 918 proteins) were used to interrogate the transporter database (TCDB). Peter Karp’s pathologic tool was used for pathway prediction . This method largely relies on the keyword matching and other automatic methods to manually curate some of the pathways, such as aromatic compound degradation. Metabolic pathways were constructed using MetaCyc as a reference data set . 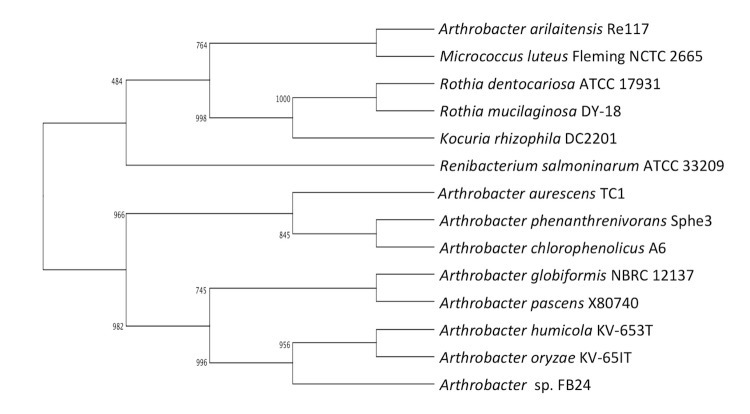 The 5,070,478- base pair genome of Arthrobacter FB24 is composed of a single 4,698,945-base pair circular chromosome and three large circular plasmids (96,488, 115,507, and 159,536 bp) (Table 3) with GC content of 65.5, 64.7, 63.3 and 65.0%, respectively. Based on a summary of genomic features listed on the Integrated Microbial Genomes (IMG)  there are 4,536 protein coding sequences identified, of which 3,279 (70.94%, Table 4) have been assigned to a COG functional category (Table 5, Figure 3and Figure 4). There are 1,257 (27.19%) predicted genes without an associated function. a) The total is based on either the size of the genome in base pairs or on the total number of protein coding genes in the annotated genome. 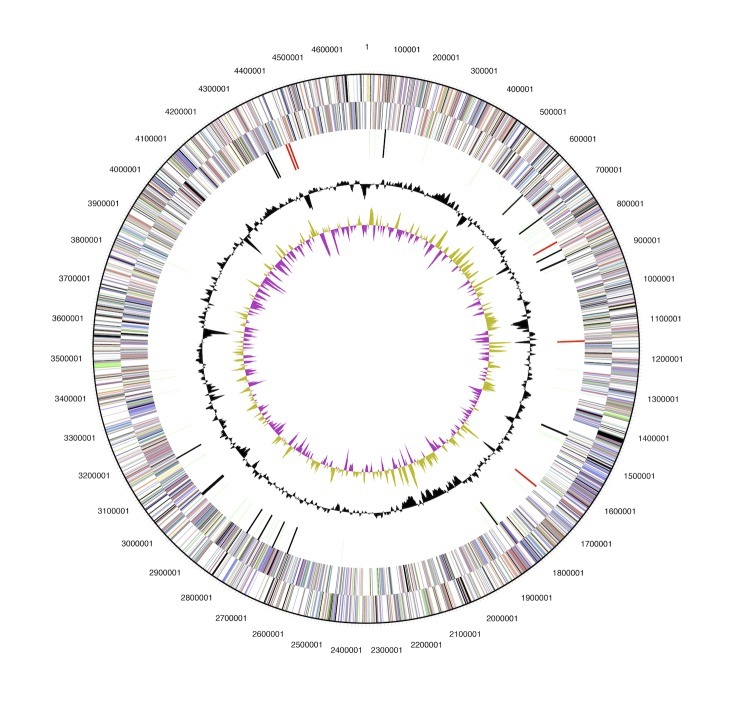 Circular map of FB24 chromosome, graphical depiction from outside to the center: genes on forward strand, genes on reverse strand (colored by COG categories), RNA genes (tRNAs green, rRNAs red, other RNAs black), GC content, GC skew. Chromosome is not to scale with plasmid maps. Circular map of three plasmids in FB24, graphical depiction from outside to the center: genes on forward strand, genes on reverse strand (colored by COG categories), RNA genes (tRNAs green, rRNAs red, other RNAs black), GC content, GC skew. Plasmid maps not to scale with each other or with chromosome map. 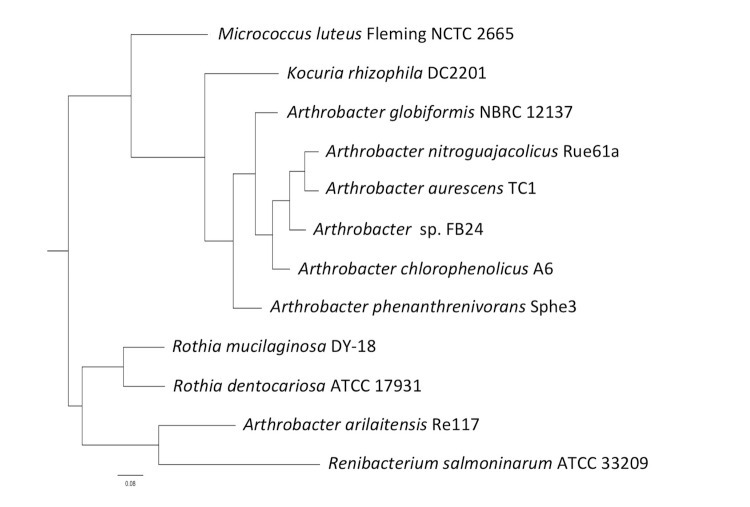 A comparative analysis of genome sizes and protein coding genes in Arthrobacter sp. FB24 and other Arthrobacter species with finished sequences (Table 6) was made from data listed on the IMG website . Included in the comparison is A. arilaitensis re117 (Gc01419, FQ311476) , A. aurescens TC1 (Gc00480, NC_008709) , A. chlorophenolicus A6 (Gc00930, NC_011886), A. nitroguajacolicus Rue61a (Gc0006272, CP003203), and A. phenanthrenivorans Sphe3 (Gc01621, CP002379) . In addition, the draft genome of A. globiformis NBRC 12137 was included because its phylogenetic relatedness to FB24 based on the 16S rRNA gene sequence. Similarity between functional protein groups (based on COG, clusters of orthologous groups) in the genomes of these strains were made and visualized using hierarchical clustering (Figure 5) with tools available on the Joint Genome Institute (JGI) Integrated Microbial Genomes (IMG) site. Also included in the tree were closely related species in the family Micrococcaceae with finished genomes Kocuria rhizophila DC2201 (Gc00769), Microccus luteus Fleming NCTC 2665 (Gc01033), Renibacterium salmoninarum ATCC 33209 (Gc00698), Rothia dentocariosa ATCC 17931 (Gc01662), and Rothia mucilaginosa DY-18 (Gc01162). Detailed information about the genome properties and genome annotation of these strains can be obtained from the JGI-IMG website at the JGI website . Hierarchical tree based on similarity of COG groups between genomes. Included are genomes of bacteria in the family Micrococcaceae with finished genome sequences. Garrity GM, Holt JG. The Road Map to the Manual. In: Garrity GM, Boone DR, Castenholz RW, editors. Bergey's Manual of Systematic Bacteriology. Second Edition ed. Volume 1. New York: Springer; 2001. p 119-169. Keddie RM. Genus II. Arthrobacter Conn and Dimmick 1947, 300. In: Buchanan RE, Gibbons NE (eds), Bergey's Manual of Determinative Bacteriology, Eighth Edition, The Williams and Wilkins Co., Baltimore, 1974, p. 618-625. Ausubel FM, Brent R, Kingston RE, Moore DD, Seidman JG, Smith JA, Struhl K, eds. Current Protocols in Molecular Biology. Hoboken NJ: John Wiley & Sons; 2003. Han C, Chain P. Finishing repetitive regions automatically with Dupfinisher. In: Arabnia HR, Valafar H, editors2006; Las Vegas, Nevada, USA. CSREA Press. p 142–147. Lowe TM, Eddy SR. tRNAscan-SE: A Program for Improved Detection of Transfer RNA Genes in Genomic Sequence. Nucleic Acids Res 1997;25:0955-964. Eddy SR. A memory-efficient dynamic programming algorithm for optimal alignment of a sequence to an RNA secondary structure. BMC Bioinform 2002;3.